Oliver Deliverance Mead, former banker and lumber dealer, died in his home, Field Point Park, here this morning. He celebrated his ninety-sixth birthday on December 29, and on Monday made his usual trip to town in his electric automobile, 1922 model, to pay his town taxes. Mr. Mead was vice president of the Maher Brothers Corporation, a large lumber and coal firm. He was president of the New Burial Ground Association and for ten years president of the Greenwich National Bank. Born on his father's farm on Dec. 29, 1842, he attended Greenwich Academy and in 1882 moved to the Sophar [Zophar] Mead homestead, Field Point Park, a house built in 1792, which he inherited with 120 acres from his cousin, Oliver Mead. He organized the Field Point Land Company and served as its president for many years, dividing the farm into home sets, which now make up Belle Haven. For thirteen years he served in the Connecticut militia and was for a time justice of the peace. In 1864 he cast his first vote for Abraham Lincoln and had voted in every Presidential election since that time. 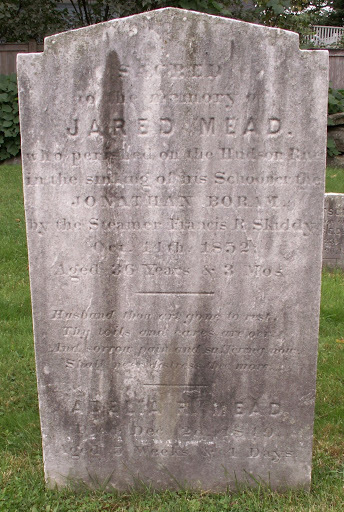 Mr. Mead sought to enlist in the Union Army during the Civil War. "They thought I wasn't physically able," he said recently, "and now there are none of them left." He was the oldest member of the Elks and Masons here. Surviving are three daughters, Mrs. Adam Reed Guy of Brooklyn, and Mrs. Newell L. Walker and Mrs. William J. Ferris of Greenwich, and a granddaughter, Mrs. Granville K. Lester. GREENWICH, Conn., Aug. 22- All of the inhabitants of the western end of the town of Greenwich, including Byram Shore, where the Mallory’s, Joseph Milbank and other New Yorkers of wealth summer, are laughing about how the Independent Citizens Association yesterday fooled Milo Mead, the “Sage of New Lebanon,” as he calls himself, and had an enjoyable excursion which he had planned to break up. Mr. Mead is eccentric. He lives in East Port Chester, but insists on calling it New Lebanon. This Spring Charles Grigg, a contractor, had a freight boat built at City Island, which he named “Milo Mead.” That gentleman loaned Grigg $5,000 in acknowledgement of the honor and took a mortgage. Saturday word was brought to Mr. Mead that the Independent Citizens Association was going on an excursion on the Milo Mead on Sunday, and already had her stocked with beer and other drinks. Mr. Mead sent at once for lawyer William Ferris to see how he could stop it. The lawyer told him to attach the boat, put a constable on board, pay him for the trouble and release the attachment Monday morning. Richard Morrell was the constable whose services were procured and the attachment papers were against Charles Grigg, Lulu Grigg, the Grigg Contracting Company and Charles Grigg, agent, all four forms being used by Mr. Grigg in business dealings. But there was a flaw in the serving of the legal papers by the constable. They could not be served on Sunday and the association was not long in finding this out. They allowed the constable to remain in possession all Saturday night. When they were ready to start they notified the officer that he would have his choice of getting off the boat or being put off. They had their counsel present to prove they were right. While Mr. Mead was hustling to the village to get out an injunction or anything else that would fill the bill, the anchor was weighed and the Citizens’ Association, with the constable as a guest, left the dock and had a glorious day of it. Mr. Mead declares he will do everything possible to prevent a repetition of Sunday excursions as long as the boat bears his name. 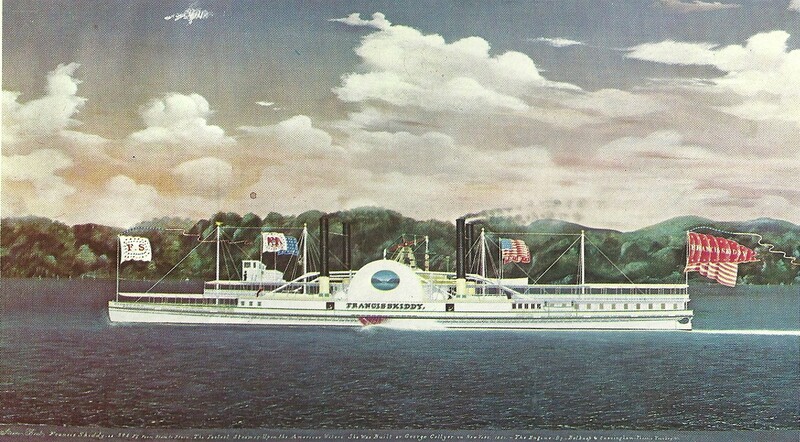 By the mid-nineteenth century steam powered ships emerged as a new innovation in travel for goods and people. Sometimes accidents happened, often with tragic consequences. I’ve read about such things in the newspapers of the times. A gravestone in Greenwich’s New Burial Grounds Association Cemetery references one such sad ending. 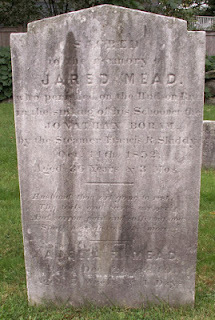 Jared Mead was the son of Daniel Smith Mead (1778-1831) and Rachel Mead (1779-1859. He was born in Greenwich, Connecticut on July 25, 1816.
aged 36 years & 3 months. A schooner, supposed to be the Jonathan Booream, belonging to AUGUSTUS STEDWELL, of Brooklyn, Captain JARED MEADE, was run into and sunk last evening by the steamer Francis Skiddy, when opposite this place. The schooner was broken in two, and the stern floated ashore with the compass and a box containing the schooner’s papers, with the captain’s coat and hat. The fate of those on board is not known, but they are supposed to have been all drowned. MR. EDITOR: - A few days since I left Troy in the beautiful steamboat Frances Skiddy. I chose this boat in preference to the cars, because of the greater comfort and finer view of the Hudson River scenery, to say nothing of the satisfaction of knowing that I was in no danger of one of those railroad “smash-ups” which have become so fearfully common within the last month or two. The boat was heavily laden with merchandise and the spacious saloons full of passengers. When about ten miles below Albany we heard a sudden crash of timbers accompanied by a heavy jar. The boat began to tip and soon the decks stood at an angle of forty-five degrees to the horizon. Men shouted, women shrieked and fainted, and children cried, while the steam-whistle screamed shrill and clear above them all. For a few minutes the scene of wild confusion and dismay was indescribable. Just at this crisis something about the engine gave way and a volley of steam rushed into the main saloon filling it in a few seconds. Strange to say no one was badly burnt. We had struck a rock, tearing a large hole in the bottom of our craft. She was rapidly sinking, slowly righting as she sank. In less than ten minutes the dining-saloon was full of water. Tables, chairs, dishes, and burning lamps were floating about. There was great danger that the lamps would set the boat afire, but no one dared venture in to get them. In five minutes more the water was a foot deep on the next deck. The baggage-master was not to be found, so we broke into the baggage room with axes, got out our carpet-bags and retreated to the upper decks, where we were rejoiced to see that a steam-tug. Which was going down the river with a number of canal boats, had just come to our rescue. By the time we had handed the ladies, children and personal baggage over to these, the Skiddy had sunk seven or eight feet more and grounded. 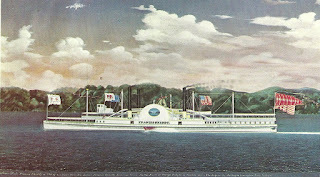 After waiting there a half an hour, the Hendrick Hudson, on her way from Albany to New York, picked us up. We were happy to have escaped without the loss of a single life, and concluded that it was not unreasonable to expect entire freedom from accidents either by land or water. The dangers encountered in trusting your life in your little inter-island coasters, (to say nothing of the Kilauea,) are perhaps no greater than the perils of travel in this most civilized and christian land.